The gleeful bloodsport of Berlinale-trashing by journalists has reached the point where it’s hard not to defend the honour of the weary, bloated festival—complaining about the quality of the Competition is like beating a dead bear, or, in the case of this year’s runner-up, flogging a dying horse. So, for the seasoned festival-goer not dependent on filing on deadline, the Berlinale represents a great opportunity to follow word of mouth and steer clear of the clunkers: all Competition titles—a whopping 16 of them in 2011—screened at least three times with English subtitles (the same holds for the Forum and Panorama as well). If only all major film festivals provided us with such a high percentage of uninteresting, sub-par films; there’s lots to do in Berlin besides watch movies. Rather than get into the reasons why this situation has arisen—let’s just say Cannes promises to be a galloping band of finely groomed stallions (and there’s nothing to do in Cannes besides watch movies)—I’ll point to the large number of German productions and co-productions throughout the festival. Yes, Berlin may be in danger of becoming a showcase purely for German-produced cinema (and Germany-based sales agents), but this also enables the first-rate German works to stand out even more; oh, that wily Kosslick, rather than only concerning himself with bowing down to the red-carpet stars or the lip-smacking adventures of Culinary Cinema, he’s actually the savviest promoter of national cinema around, whether or not he knows it. Two of the festival’s best works, Dreileben, a joint Forum-Panorama presentation, and Ulrich Köhler’s constantly intriguing third film, Sleeping Sickness, winner of the Silver Bear for Best Direction, might have been buried in a festival with riches greater than one Béla Tarr film—the former due to its length, the latter because of its willful haziness. 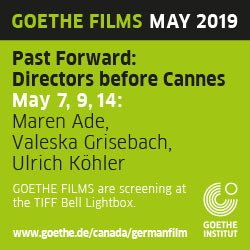 But in Berlin they stood out like the graffiti-laden slabs of the old Wall in Potsdamer Platz, reminders that German cinema is now producing art film at a level on par with any other time in its history. Shot in Africa, where his parents worked as doctors and where Köhler grew up as a child before leaving at an early age (the film is set in Cameroon, Köhler’s experiences were in Zaire), Sleeping Sickness is not a political film, nor most definitely a politically correct one: this is a film where an African child is seen wordless and carrying a machete. Köhler is not out to make a film “about Africa,” though Africa certainly plays a major role, one integrated into Köhler’s usual concerns about home, homelessness, and place (this is, after all, a director who called his 2002 debut Bungalow; he’s likely the most personal filmmaker of the so-called Berlin School). All of the characters in Sleeping Sickness are displaced, and find various ways of dealing with these displacements from a European perspective. Africa remains, albeit slightly, an abstract entity that impacts on Köhler’s characters’ actions and their interactions; a necessary but not sufficient variable. Just as much as it represents “the dark continent,” a foreign place that can still be exploited for personal and financial benefits—represented in the guilt-free, gone-native colonialist minor character of Gaspard (Hippolyte Girardot)—for Köhler’s two main characters, Africa is a place that isn’t home, and this characteristic has the ability to both attract while being repellent (in the case of Ebbo) and repel while being attractive (Alex). The native voices of Africa that Köhler provides are either officials who seem a bit corrupt, or Ebbo’s secondary family who he implies relies on him for financial support by preying on his own insecurities as a foreigner suffering from white guilt. Indeed, Sleeping Sickness is often deliberately filmed as if through a foreign tourist’s eye, and sometimes even with an eye of its own, its roving camera at times just taking in the overgrown vegetation and/or the dusty scenery. The film begins with a scene suffused with a sense of dread that never quite recedes. A nighttime prelude on a highway shows that Ebbo Veltin (Dutch actor Pierre Bokma, who resembles a shorter, older version of the director himself—or could pass for his father) is a doctor on missionary work in Cameroon. His child (her passport missing) has arrived from Germany to visit Ebbo and his wife, and after being harassed by soldiers, the family returns to their gated residence—which needs constant watch (though the guard, Joseph, seems to spend most of his time asleep)—and enters. As in so many of the film’s scenes, a style of shooting common to Köhler’s cinema, Patrick Orth’s camera stays outside, peering through the glass front for a lingering moment in a typical master shot. Numerous scenes in Sleeping Sickness are shot through windows, most from the front seat of a moving car—viewing the country at a remove—which here feels less academic a style of framing than in Bungalow or Windows on Monday (2006). The implication is not that Ebbo is trapped in Vanga, but, we come to understand, by the structure of the family itself. He’s uneasy at having to leave his clinic, where the cases of sleeping sickness have been exaggerated (or he’s been successful in eradicating the disease, it’s never explained). Through his interactions, especially those with his family, we get glimmers of a notion that there’s also something troubling in his relationship that can only be recognized by the few who truly know him (at one key moment, while embracing in bed, his wife tells him: “I can see that you don’t want to sleep with me,” a comment which seems to come out of left field). This arm is extended even further in the second part, as for a prolonged stretch of the film, it’s unclear as to what point in time we’re dealing with or how the characters relate to each other. The only thing that is somewhat familiar is the location, and even that is seen through a second perspective, that of the French-born doctor of Congolese origin, Alex. 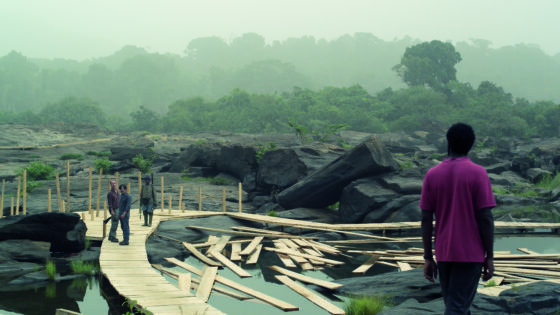 Though there is a slight mirroring of Ebbo and Alex, there’s nothing simple about it, and this structural looseness is perhaps the closest that Köhler’s version of the cinema of the opaque comes to Apichatpong; to make this comparison due to the mere presence of a jungle is indicative of lazy thinking, akin to bringing up Claire Denis because she’s also a European filmmaker shooting in Africa. Indeed, I suspect most people who will watch Sleeping Sickness, like myself, will have formed their views of Africa through fiction, literature or film made by Europeans—hence the many comparisons of Sleeping Sickness to Joseph Conrad or Graham Greene (Köhler says the film was sparked by Sudanese author Tayeb Salih’s Season of Migration to the North, and indeed the main characters are richly novelistic and complex—they jump off the page). In his second beginning, Köhler first destabilizes our sense of place: the second part begins in another glass-surrounded space, a more antiseptic one. Soon it’s apparent we’re in France, with a black economist or politician delivering a rather pat address on the failures of foreign aid to solve Africa’s problems (to me it comes across as rather parodic in its clunky directness). The film soon focuses in on Alex Nzila (a unique, well-drawn, and immediately appealing character as played by Jean-Christophe Folly, who also appears in Denis’ 35 rhums ). In part spurred on by disagreeing with this speech (“Only the market can solve Africa’s problems”), Alex leaves his secure and unfulfilling job prescribing malaria pills to travellers, to travel to Africa for the WHO. His purpose: to investigate Ebbo’s practice. But Ebbo is nowhere to be found. When we left Ebbo, he was preparing to return to small-town life in Germany (to, as Gaspard quips, doing exactly what Alex was doing—prescribing malaria pills to travellers). The cut to black occurs as he’s in his empty house (where, as he says, there’s nothing left to steal), crying into the phone to his wife, who has already repatriated. In Africa for the first time, the suddenly uprooted Alex fruitlessly attempts to become acclimatized. He manages to make his way to Ebbo’s village, and is led in the dark to his temporary residence on the same property: one spot-on detail in a film loaded with them finds Alex, late at night in his mosquito net-covered bed too frightened to go outside to pee, so he urinates into a water bottle. It doesn’t get easier for Alex: the next day finds the queasy doctor having to perform a caesarean on the woman living in Ebbo’s house, which makes him puke, sending him to bed again, where the at-long-last appearing Ebbo nurses him back to health. It becomes clear that the cut to black has taken us forward a number of years, and that Ebbo is a changed man. Having stayed behind and impregnated a local, he’s acting on edge as his daughter is returning to Cameroon, unaware of her father’s new arrangements. It’s as if he’s been possessed. The masterstroke in Köhler’s screenplay is how the destabilizing aspects of the narrative place viewers—for entirely different reasons—in the same off-balance mental space as Alex, who comes across as permanently jetlagged, despite the fact that Cameroon and France share a time zone. (Köhler again, writing on Ken Loach’s Family Life: “the screenplay destroys all inner-scenic beauty by political exploitation. It doesn’t leave room for openness, ambivalence, and complexity.”) Something has instilled a bit of the Kurtz in Ebbo, and though Köhler surely has some idea, he leaves the gaps in for us to fill—daring simpletons to proclaim the cause as “Africa”—and then takes it up a notch. In the last extended sequence—one might say the film’s third part— Köhler places us in the nighttime jungle, and lets us get lost again. 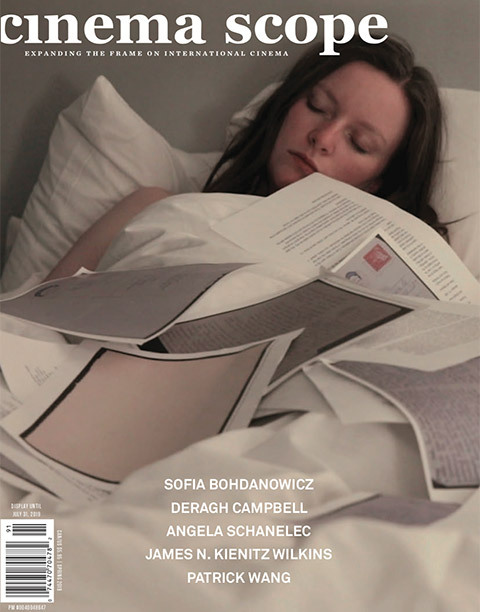 The events and the atmosphere of the night-hunting sequence which is the climax to Sleeping Sickness plays out as a dark, dark dream bordering on, but not quite reaching, a nightmare; this in a film where there are no less than 15 instances of characters asleep or in bed. In the pitch black, his characters need headlights to begin to know which step to take (the illumination of people’s faces and the jungle caused by these lights are a visual treat throughout), but in his version of The Passenger (1975), Köhler knows exactly where he’s going. After a shadowy series of events, as night turns to day, maybe Ebbo has finally found his home, even if this, too, is punctuated as a hippopotamus-sized riddle hearkening back to Ebbo’s retort near the end of the first part: “I’m in development, I have to believe in transformation.” Cue the Art of Noise.